Growing your own food is cheap, sustainable and having the plants around spruces up even the dreariest room. Here are 11 edible plants that are super easy to grow inside or outside, in cities and suburbs, regardless of your past gardening disasters. As a bonus, they can all be used in your next salad. Bursting with vitamins and ready to eat in only a week or so, microgreens are a perfect edible plant for the impatient gardener. The trick to growing great microgreens is keeping the soil moist, not wet and cut the greens as soon as they sprout over the dirt. All you need to grow your own avocado plant is an avocado pit, three toothpicks and a glass of water. Once the seed sprouts and the roots have been established in the water, you can transfer the plant to soil. The downside is that a plant takes seven to 10 years to produce fruit. Kale is hearty and takes the cold well. Plant kale seeds from early spring to summer. The leaves can be harvested once they grow to about the size of your hand. Place growing kale in a spot that gets plenty of sun. Basil is easily available in many produce departments as a full plant you can bring home, use and plant. Basil plants give a clean, fresh smell and are a pretty kitchen plant to keep handy on the counter. Basil needs just the right amount of water and grows best in plenty of sun. Another cold weather plant, carrots are great because of all the differentvarieties of carrots you can grow at home that aren’t available in grocery stores. 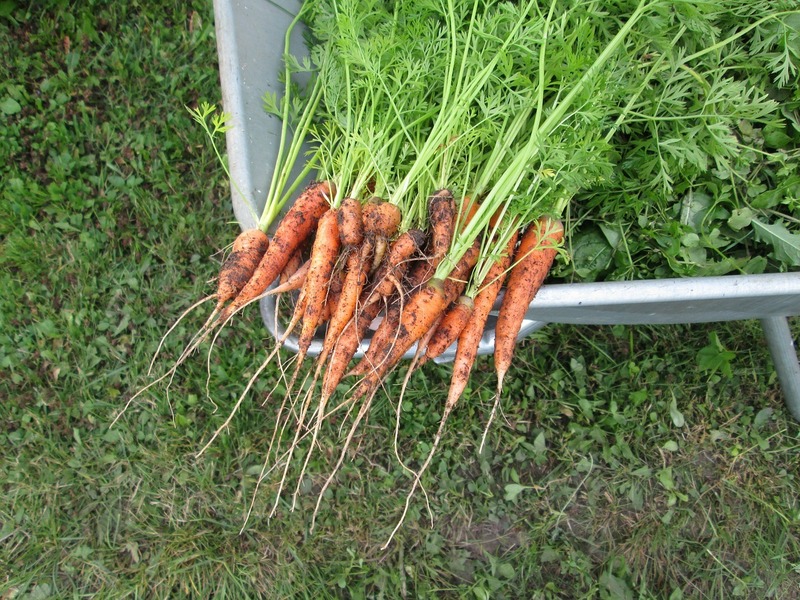 The carrots’ taste improves as they continue to grow and extras will keep for a long time in the fridge and can be pickled or canned. Tomato plants will grow fastest in a warm, humid environment. Although there are many types and sizes of tomatoes you can grow at home, it generally takes 65 to 70 days for a plant to produce a ripe tomato. When they’re at their peak, pick tomatoes off the vine by gently twisting off the vine. Plant a section of ginger by soaking it in warm water overnight and planting it in soil. Ginger plants grow best in light shade. It should take 10 to 12 months for the ginger plant to reach maturity. Use mint in soups, salads and even make mint tea. There are several varieties of mint you can grow and they all do best in a moist, cool spot with shade. If you plant mint outside, be careful because it grows quickly, is hard to kill and can be invasive on other plants. Chives have a light onion flavor and grow quickly. In fact, a transplanted chive will be ready for harvest in 30 days, and a seedling is ready in only 60 days. The chive plant will also produce flowers, which are tender and delicious and can be added to soups and salads.